Please note: Mapit NTRIP Client is using RTKLIB library and you need to have a supported GNSS receiver to be able to use it with this application. Before buying subscription please do ensure that your receiver is working well with the app (7 days FREE Trial is available to test the application). RTKLIB compatible receivers can be found here: https://wiki.openstreetmap.org/wiki/RTKLIB-compatible_GPS_devices, however other devices may be also supported but you need to determine this yourself. The manual below is based on RTKLIB Manual and Mapit NTRIP Client is an Android port of the original library – the “demo 5” by Tim Everett. The application inputs raw observation data of GPS/GNSS receivers and execute navigation processing in real-time. By setting the positioning mode to Kinematic and configuring the rover and the base station receiver data inputs, RTK-GPS/GNSS is enabled with OTF (on-the-fly) integer ambiguity resolution. The following figure shows the data flow in the app. You have to set up Input Streams, Output Streams (optional) and Log Streams (optional) for real-time positioning. For real-time positioning with Mapit – NTRIP Client, you have to input the raw observation data and satellite ephemerides from the GPS/GNSS receivers. To set the input stream, click “Input streams” on the app menu. 3. TCP Client (Connect to a TCP server and input data via the TCP connection) – If you select “TCP Client” as the stream type, you can then set the options of “TCP server address” and the “Port” number with the “TCP Client Options” dialog. 4. NTRIP Client (Connect to a NTRIP caster and input data via the NTRIP) – If you select “NTRIP Client” as the stream type, you can set the options of “NTRIP Caster Host” address, “Port” number, “Mount-point” of NTRIP caster, “User-ID” and “Password” with the “NTRIP Client Options” dialog. If you keep the “Port” field blank, the default port number (2101) of NTRIP is used. Note that “User-ID” cannot contain “:”. 5. File (Input data from a log file). You have to select the stream data format from the following options with the pull down menu under “Format“. You shall configure your GPS/GNSS receivers to output at least GPS/GNSS observation data and navigation data (ephemerides). For detailed operation for the receiver settings, refer the appropriate manuals for the GPS/GNSS receivers or contact Manufacturers. 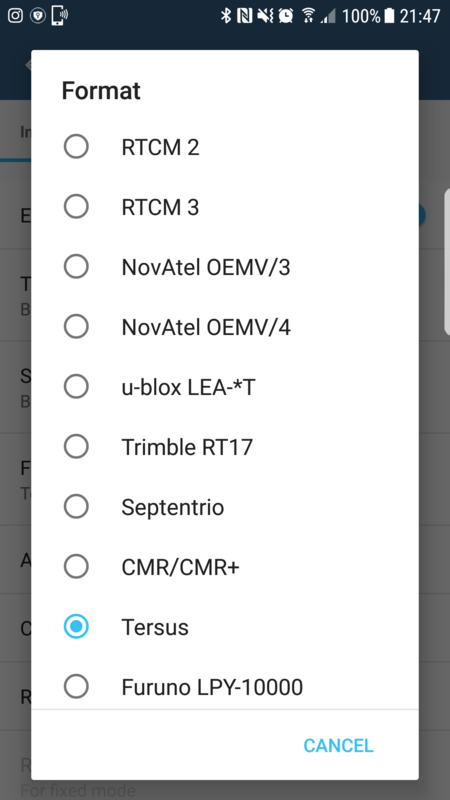 In case of using a NRTK (network RTK) service, which requires NMEA GPGGA messages to select reference station or to setup the (virtual reference station) position, select the message content with the pull down menu at “Transmit NMEA GPGGA to Base Station”. 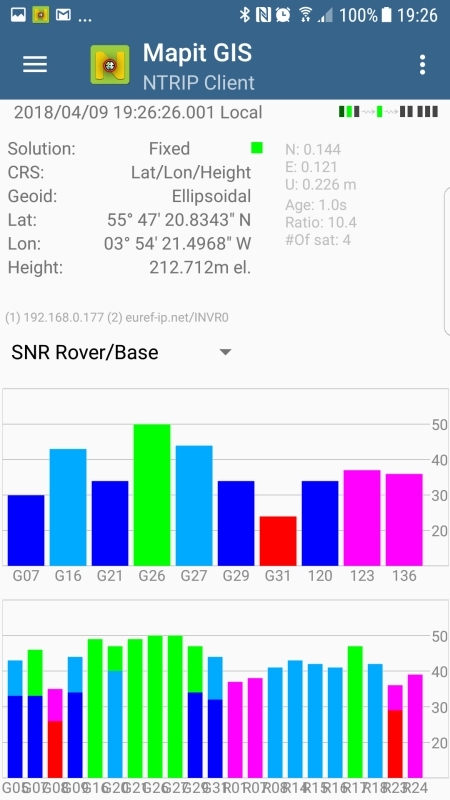 If you select “Latitude/Longitude” to send a fixed position, fill in the latitude and longitude of the position for NMEA GPGGA messages in degree (minus means south or west). Similar to the ROVER input stream you need to set the BASE once – this is usually done via NTRIP (Network Transport of RTCM via Internet Protocol) caster. After the BASE and ROVER is set up, you can start the RTK Service and start processing the data to get RTK solution which then can be used in Mapit application. Push “Start Service” switch on the navigation drawer. The status of each streams are shown on the upper right indicators. 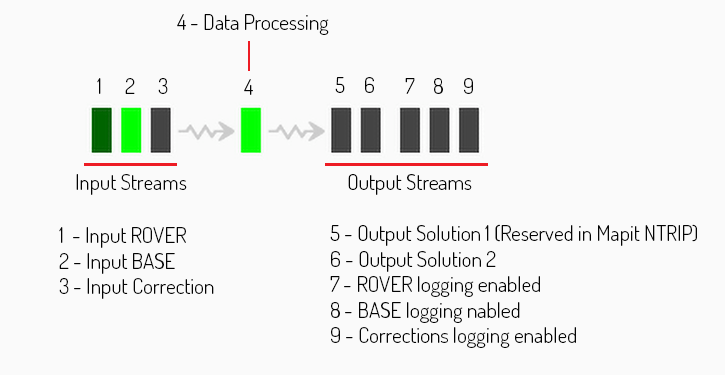 From the left, they show the stream/processing status of Input Rover, Input Base Station, Input Correction, the positioning process, Output Solution 1 – (this one is not available in Mapit NTRIP Client as it has been reserved for internal use), Output Solution 2, Log Rover, Log Base Station and LogCorrection. Gray represents not used, Orange means waiting for the connection, Deep‐green means connected or running, Light‐green means data active (input, output or processing) and Red means a communication error occurs. To stop the positioning process in Mapit NTRIP Client – push “Stop Service” switch. # of Sat (number of valid satellites). To switch the format in the solution display, push the Settings button in upper right corner. You can switch the solution to Lat/Lon/Height (degree/minute/second), Lat/Lon/Height (degree), X/Y/Z‐ECEF (m), E/N/U‐Baseline (m), Pitch/Yaw/Length‐Baseline (deg, m), alternatively. The Height element in Mapit NTRIP Client is always ellipsoidal – Geoid height correction can be then set in Mapit GIS if required.